Posted August 3, 2016 & filed under Blog, News. Wellntel is pleased to present a major innovation for water management on homes, farms, and natural lands. Wellntel TANK continuously and remotely monitors the level of water in a storage tank, a cistern (or with some special provisioning, a stilling well) and can be programmed to send email or text alerts for conditions like when the vessel is near full or near empty or a surface water source is high or low. Information is accessible via the Wellntel Dashboard using a computer browser or smart phone via a private login. For Homeowners and Farmers with Tanks: With Wellntel TANK you can spot leaks, know when it is time to turn a pump on or off, conserve water when to makes sense. You can set alerts and receive a text message or email when a tank is full or empty. When Wellntel Tank is combined with a Wellntel Groundwater Information System, like a Static or +Pump Level Sensor, you can you can track water underground and in storage, look for relationships between pumping time in a submersible well and tank capacity, and know if it is time to increase storage capacity. For the Hydrologist or the science-minded, Wellntel TANK adapted for stilling well duty situated near to a Wellntel Science or Static or +Pump kit on a groundwater well can create a groundwater-to-surface study tool. Using these two sensors, it is possible to spot hydrologic relationships between pumping and stream or pond levels, for example. Since each site is different, please contact a member of our science team at info@wellntel.com. In this screen grab, you can see two watering events and a pumping event to refill the tank. The owner was alerted via text message when the level reached FULL and pumping was turned off. Wellntel TANK is designed to be mounted on and above- or below-ground storage tank, as long as the roof or hatch are accessible and can be adapted to recieve the Wellntel system. It can be power by battery or an optional solar panel or AC power if available. Data is intuitive and simple to understand. 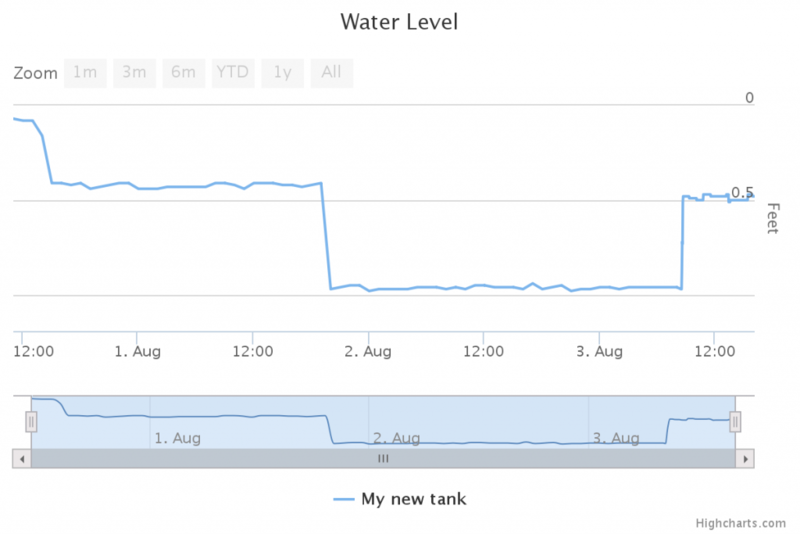 You tell Wellntel TANK how deep your tank is, and it will tell you when it is full or empty, or anywhere in between. You can set reading intervals and alert ranges and formats, choosing text, email and sharing. Installing Wellntel TANK is easy. 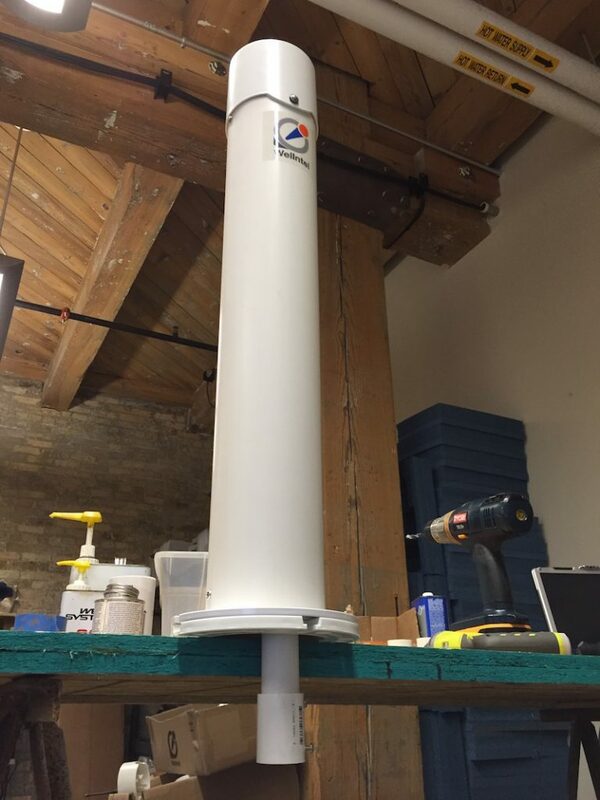 We provide all the parts and pieces to mount the sensor on a tank, including the sensor, a special tank tower/mount (to get it up and away from doors and hatches and lift the antenna), drill/cut patterns and complete instructions for installation. Orders received before the end of August, 2016 should ship within three days of receipt. Contact your local Wellntel dealer or get yours here. If you’re unsure about what you need or need help picking the right system, call us at 844-WELLH20 (844-935-5426) or email info@wellntel.com.